Does Amherst Misreport Its SAT Data? Comments Disabled To "Black/White SAT Scores at Amherst"
Some other trends I’d like to analyze: how predictive high school GPA is to college GPA, the SAT gap between asians and whites in elite campuses, and the GPA gap between asians and whites. I’m with Williams Alum on this one. As I’ve mentioned before, I think that discussions of average grades/scores/accomplishments by groups of students broken down by race are divisive, and misleading on an individual level. That the “average” left-handed Eph has a combined SAT score of 1237 and a 3.76 GPA doesn’t tell us much about how any specific left-handed Eph has done. I vote yes. We need to know more about the consequences of discrimination against whites and Asians at Williams College. Waaaaaahhhhhh! Poor, poor white people! When will we ever get a break! Do you honestly believe this matters? Really and truly, if you’re the type of person who complains about grade inflation (as DDF is), then doing these two things you want this College to do would cancel each other out, as adding in more students who bubble answers in well would matter less as we would then curve everyone down and keep the GPAs the same. And because the harm here is the black kids have, on average, lower GPAs, (the horror!) the result of implementing both would be a similar-perhaps lower!-collection of GPAs for a radically less diverse and less interesting student body. It’s not so funny when you are the white boy or girl who is discriminated against by affirmative action. This sort of discrimination that creates hatreds and resentments that last a lifetime. Looks like the majority voted for discouraging the minority from talking about… minorities. Ah well. To 6, DDF’s goal is to gauge the average academic capabilities of demographics in elite campuses, which exist primarily to realize the potential of the nation’s brightest. 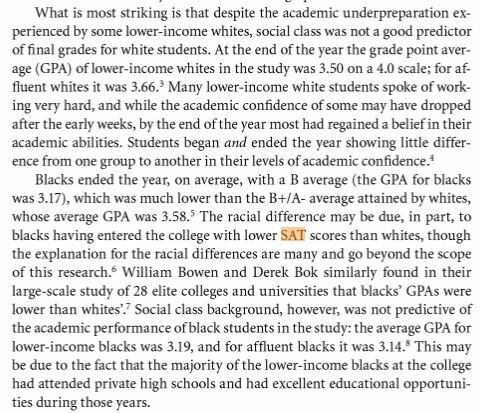 That whites as a group are more adept at academia, even taking into account socio-economic factors, than blacks should be important for elite colleges to understand, if they are interested in gathering a truly exceptional student body. I’m pretty sure it’s not the reason he resurrected a 9 year old book that largely, fundamentally, disagrees with his claims about college in its analysis of its data (one he referenced for the same damn point in 2009: http://ephblog.com/2009/01/21/true-and-well-intentioned/ and we got into the details there that explain the gaps you discuss with some specific citations). DDF’s “goal” is not so neutral, to claim so is to claim Comey was fired because he mistreated Clinton. It’s the cover story, not the real rationale. Also SES and pre-college education pretty much do explain the entirety of the GPA gap in college. See: Source of the River. Plus, “more adept at academia” needs a lot of unpacking about what is academia, how it evaluates students, and why. What you and DDF want to analyze is largely asked and answered already in the sociology of higher education literature (see Espenshade’s work along with Source of the River and other research using the NLSF data). the “Asian advantage” is primarily a story of high familial human capital and aggregation errors in data handling (nation/ethnic identity more important than the pan-ethnic “asian” moniker used in the US. See work by Jennifer Lee, Grace Kao, and Min Zhou on that). I’m not sure that is either. Instead of ascribing motive, let’s just ask. DK, what’s your goal for this post? > DK, what’s your goal for this post? 1) My main goal for this post is to print the truth, especially a truth that many (most?) people at Williams — students, faculty, administration — are unaware of and/or don’t believe. 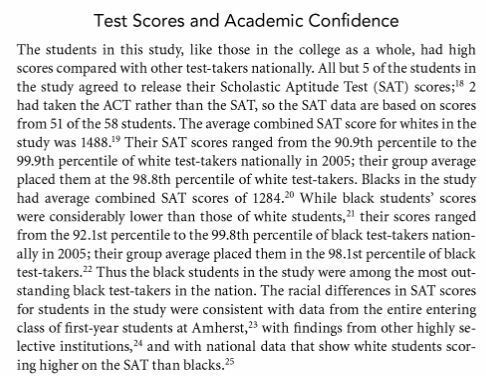 The difference between the average combined math/verbal SAT scores between whites and blacks at Williams is probably around 200 points. 2) A secondary goal is to bring greater attention to this book. It is really good. And, even though it is about Amherst, I bet that most of it applies to Williams. Question for Sigh: Is it a good book? 3) A third purpose was to gauge interest in further discussion of this topic. Taking a weighted average of responses (with extra weight to WW and WA), it looks to me that the answer is No. So, I won’t be blogging about this book for at least a year. Other EphBloggers are, of course, free to do so. I’ve yet to peruse the 2009 post and Source of the River, so thank you for bringing them up to me, sigh. JCD — You went to Cornell for your PhD and got a job at Williams that YOU screwed up by not publishing. You have NEVER been a victim of affirmative action, and it is a flat-out lie to say as much. Glad to see I’m living rent free in you head. I’m getting cited right now in the most important book in the marketplace. Nothing wrong with my work that being a privileged minority would not fix in a flash. Your scholarly work is not being cited. Some of your loud me-me-me “journalism” is being mentioned. And good for you. But as usual you are blowing this up far beyond what it means — the “most important book in the marketplace”? Laughable. So far the reviews have not been good in part because he has relied on a range of laughable sources — you met Obama perhaps a handful of times (you claim), yet he was at Occidental at EXACTLY the same time that you were in your first years at Cornell for your PhD. How on earth could you have met him that often? You’ve managed to fudge your resume yet again. You did not deserve tenure at Williams — which you admitted in a Record piece in your last year at Williams. It is only revisionist history that has allowed you to create this myth that you were denied tenure for a job you had received based on affirmative action policies that are far friendlier to job applicants than they are relevant to the tenure process, a process that plenty of white Wiliams professors successfully navigated in the mid 1980s. I think your unhinged hatred is causing you to lose perspective. President Obama reviewed Garrow’s book prior to publication. If there is anything even slightly inaccurate in my report of young Obama’s radical, revolutionary ideology, then Garrow has heard the president’s case. According to Garrow, my account is sound and I am not surprised that he has included my articles in his new book. I suspect that Garrow is a far better judge of the value of my work and my insight into young Obama’s character than you. I’m grateful I was one of the 1,000 interviewed by Garrow as part of his research. I think you have to admit I have helped blow out of the water any doubt at all that Dreams from My Father was an accurate, truthful account of young Obama’s life while he was at Occidental College. I’m honored to have played a small role in ripping up Obama’s legacy and exposing his deceit. I have not finished Garrow’s book. It is ridiculously long. One of my favorite authors, Jack Cashill, makes a convincing case that Garrow misses the mark when sorting out the true authorship of Dreams from My Father. FYI: The doctoral dissertation which was so grievously maligned by the Williams College political science department continues to be cited in the academic literature. It looks like me, my publisher, my editor, my fellow political scientists and the American Political Science Association were all better judges of extraordinary academic excellence than any of my detractors at the previously prestigious Williams College. Unhinged, unproductive hatred still seem to be an occupational hazard over there that interferes with nurturing brilliant work. You made the same mistake. If you want to legitimate your work by appealing to academic elites, you can’t support your social thesis-that valid and deserving work from straight, white men is disregarded by everyone else despite its worth. If everyone but Williams is right, then the creeping Left cannot be as dominant as you say they are. Either 1) keep claiming that society is rigged and elitist but stop bragging about your Cornell PhD, your *tremendous* professional accolades, and your widespread recognition from the rest of the field or 2) acknowledge that the power of the identity politics Left is extraordinarily diluted outside twitter and it probably wasn’t hate for your skin color that motivated your firing. I know, I know, I’ve been brainwashed by all my professors here at Williams. But it seems to me that your generally-thirsty approach to elites necessarily conflicts with your anti-elitist political posing. This comment thread has probably gone on long enough. Doesn’t anyone have thoughts on the proper staffing if student support services at Williams? That is a topic worth obsessing over!